Stained glass look ... no sharp edges! Acrylic tiles lend that signature look. 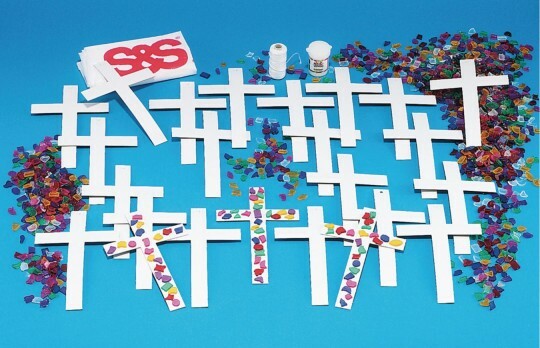 Sticky back chipboard crosses make it easy. And no sharp edges to worry about! Everything you need to make 24 projects. These are to be used for our VBS program. When making the sample I was pleased with the quality of not only the tiles but the super stickiness of the crosses. I think these will be a hit! A very simple project that women from a third-world country were able to do in a reasonable amount of time in a very large crowd and take home something to decorate their homes and remember the Gospel that was preached. We separated the project and gave each woman a zip-lock bag with supplies and helped them with the glitter part. This is a terrific cross craft that we have used before and are including in Vacation Bible School this year as well. It is easy for all ages--we have 3 years through 4th graders and they all enjoy it. We offer colored sand as an option in addition to the glitter to fill the spaces between the tiles. The kids all love it as they can be creative and design their own unique look on their crosses. 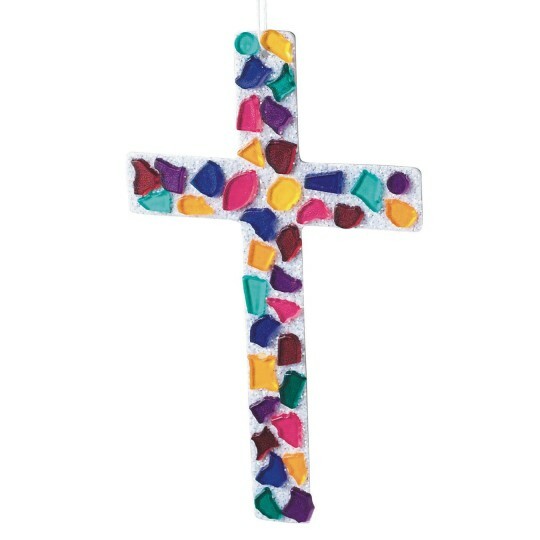 Can be used with a large variety of ages.Thankful for a quality attractive cross craft. We need more options like this.